Just Got Engaged? Plan Like a Pro in Just 4 Steps! The road to forever is smoother with the right financing. Congratulations! You’re now about to embark on a journey that will change your life. But in order to enjoy your once-in-a-lifetime walk down the aisle, you’ll need to go through a lot of planning and organization. Suppliers will need to be tapped, and to do that, you’ll need to have your finances in order. To help you, we’ve listed a few tips to keep your accounts in check. 1. Plan within your means. A lot of brides get carried away with their idea of an ideal dream wedding, that they spend so much money and forget that they don't just have to prepare for a ceremony, but also save for the marriage. Avoid starting the rest of forever in debt by creating an event that’s both beautiful and pocket-friendly. After all, you don't need to spend so much to create wonderful memories. 2. Find the best and cheapest suppliers. Getting the biggest names in the industry ensures quality services during the biggest day of your life, but you don't need to go over your budget just to get them. You can turn to other suppliers who aren't as popular but can also deliver beyond expectations. Take time to ask around, visit wedding fairs, or go through online forums. You're bound to find the right supplier for you with a little patience. 3. Book as early as you can. Reserve your venues after you get a proper headcount of guests. Don't wait for the last minute; oftentimes, it’s more expensive to do so. 4. Get help from a trusted bank. Making your wedding day a memorable one is possible with a reliable financial partner. 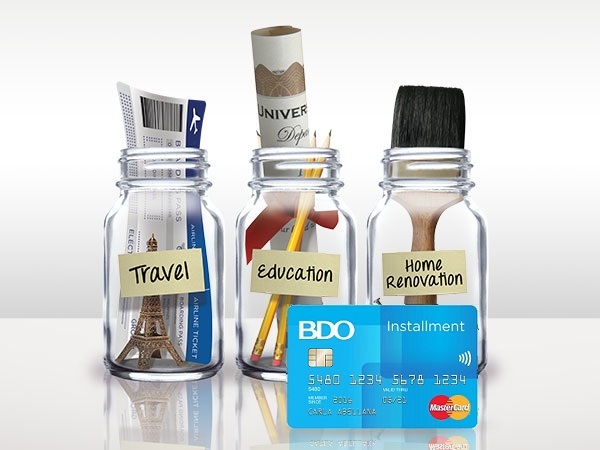 BDO offers a great product in the form of its Installment Card, which gives you financial flexibility and accessible cash for your every need. Be confident about your wedding finances and let BDO help you find ways to your happily ever after. Get cash for as low as 0.70% per month for 12 and 24 months terms with BDO Installment Card. Promo runs until June 30, 2016 only. Click here to know more and to apply now. This article was created by Summit Storylabs in partnership with BDO Installment Card.